Who would of thought that we would have a new record for MASS attendance with 10 people. It was almost a “standing room only” situation. There was Dean, Silvio, Jim A., Dave, Harry, Dennis, Beth, Chad, myself and Dave’s friend Calvin. One thing I noticed is that when we have that big a group our questions and answers can ramble far from the current topic. But I enjoy the conversational tone so I’m not sure what the best solution is. Maybe a few less topics on my part. I shared with the group that Carol and I got to see a relatively rare occurance in the sky. On Sunday morning, Sept 16, at 6 AM I got a notification on my phone that the ISS was passing overhead. We had seen the ISS quite a number of times and it was partially cloudy, but we decide to take a peek anyway. We were watching to see if we would see the ISS from between the clouds. Sure enough there it was, but wait another object was trailing the first by about 10 degrees in the same orbit. I did a quick check on the Internet and found that the Dragon capsule had just unberthed from ISS and was about to land in the Pacific. How lucky! There was only a 5.5 hour window to see them both in orbit! SpaceX with this Dragon mission had just completed the original COTS1 (Commercial Orbital Transportation Services) contract. Dragon was bringing down 3800 lbs of experiments and unneeded equipment which included 20 live mice who spent a month on the ISS. The mice will be studied for blood vessel development in their brains and eyes as well as tracking cartilage loss in hip and knee joints. Results from the analysis will help with 0-G effects on astronauts and treatment for arthritis patients back on Earth. There also will be analysis of lung tissue grown in space and of protein crystal formation that will play a role in Parkinson’s disease prevention. Dragon is the only capsule that can bring back large amounts of material from the ISS. The Soyuz capsule only has room for a couple of hundred pounds of stuff other than its 3 people and there is no refrigeration capability as on Dragon. The NASA’s COTS1 contract with SpaceX was $1.6 billion for 12 missions carrying a total of 44,000 lbs to the ISS. Even though there was one failed mission, SpaceX exceeded the goal by lifting 53,400 lbs to the ISS and bringing back 38,200 lbs of experiments and equipment. NASA has given SpaceX an extension of 8 additional missions. 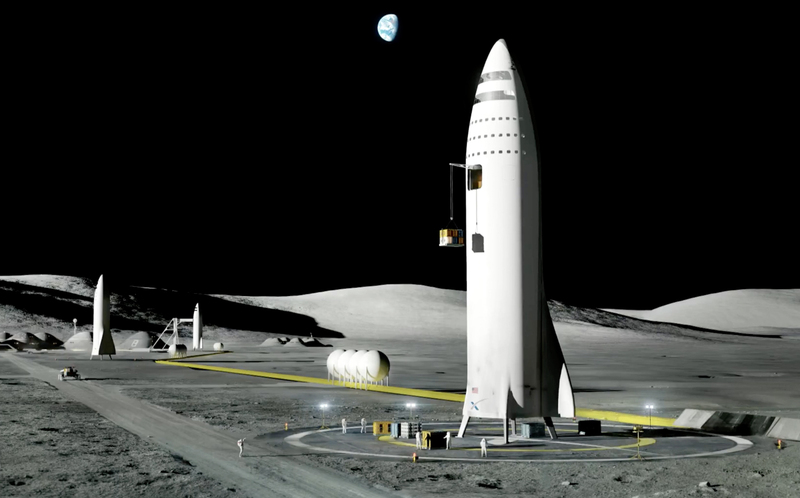 SpaceX plans to fullfil the extension missions by flying previously flown Dragon capsules. The other company in COTS1, Orbital ATK (soon to be the Orbital ATK a division of Northrop Grumman), had a $1.8 billion deal for 8 missions. They still have one more mission to fly this December where their Cygnus capsule will be named Gene Cernan. They also had one failure. So far they have lifted 28,800#. Their capsule burns up on return from orbit. They have gotten an extension for 3 additional missions but you can see that NASA is rewarding the more successful company SpaceX with more additional missions. Soon SpaceX and Orbital ATK will be joined by Sierra Nevada’s Dreamchaser in the COTS2 program starting in 2019. Each of the 3 companies are guaranteed 6 missions to the ISS. It will be exciting to see Dreamchaser land on a runway and exceed even the Dragon in the timely return of experimental results. Our other preliminary topic was watching the Planetary Society’s Lightsail2 cubesat deploy its 32 square meter mylar sail from a 10 cm on a side (4 inch) enclosure. 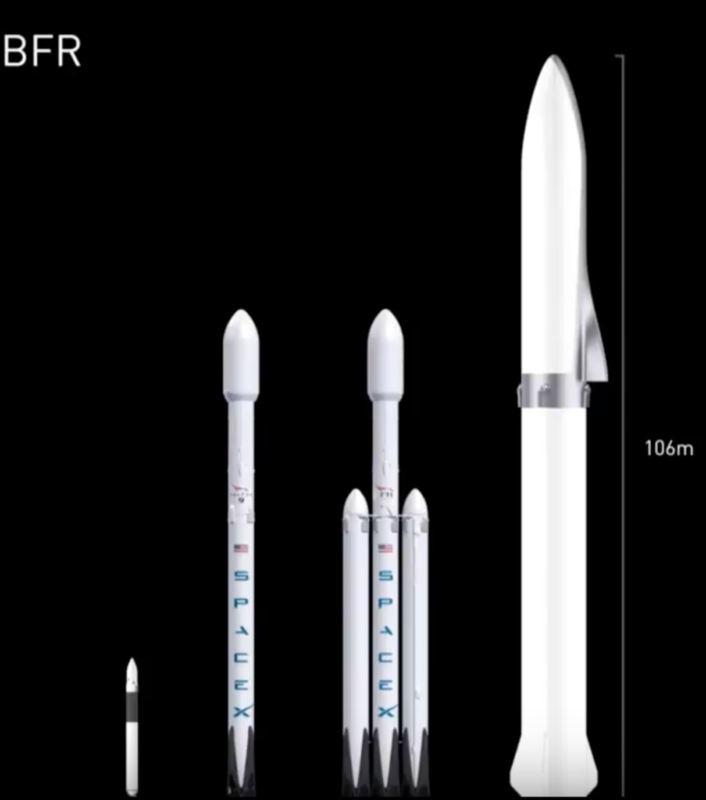 The satellite is scheduled to fly on the second Falcon Heavy rocket no earlier than April 18, 2018. Chad and Beth have supported the funding of the project and their $20 contribution entitles them 20 chances to be selected to join Bill Nye (the Science Guy, President of the Planetary Society) and watch the launch all expenses paid. I wish them all the luck to be selected. Dave shared a little about his trip to India. He was quite close geographically to the city where the Indian Space Center is located. But he wasn’t successful in negotiating a tour of the facility. Indian has done some phenomenal missions in space on a small budget including their MOM mission which is in orbit around Mars. A group called Team Indus is also one of the leading teams in the Google Lunar X Prize competition. Dean said we will kick off our “Cosmos” class in January. He encouraged everyone to obtain a copy of the book which can be obtained “used” on Amazon for about $6 of new for about $15-18. The class will include reading a chapter and then watching the DVD at our meeting. We’ll then discuss the material and comment on what has transpired since the TV series aired in 1980. I’m lucky that I have a hard copy “first edition” of the book that I remember as the last gift I got from my father. SpaceX launches two more times bringing the total to 15 for 2017. They still have 5 more Falcon9 and the first Falcon Heavy launch scheduled for 2017. This might make SpaceX the most prolific launcher for the year beating out Russia, China and any other country or entity. As SpaceX celebrates their 15th launch and 18th booster retrieval (11 by barge and 7 by land), they have also reused their boosters 3 times to place a second satellite in orbit. With all of SpaceX’s accomplishments we thought we could also show their landing attempt bloopers too. 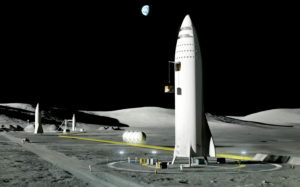 Elon Musk announced at the IAC (International Astronautical Congress) in September that he will be re-tooling his factories within a year to stop manufacturing Falcon 9 and Falcon Heavy rockets and switching production to his new totally recoverable BFR rocket. I hope that isn’t too aggressive of a schedule. 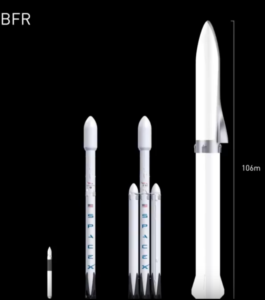 BFR docked to ISS. It sure looks big! Juno mission is gathering data more slowly because it remains in a 53 day orbit rather than the 14 day intended orbit. Scientists are hesitant to fire the engines to change the orbit because of a balky slow reacting valve. The longer orbit means it will take 4.5 years to complete the planned number of orbits around Jupiter. But it is taking great closeup pictures when it does its dive down to only 3000 miles above the cloud tops. Here is the Red Spot and here it a great shot from about the south pole. At the poles, Jupiter loses its banding and gets replaced with a bluish tinged mishmash of storms. Juno is able to peer hundreds of miles below the cloud tops and analysis of its orbit is showing that the rocky dense core of the planet is much larger and more difuse than scientists originally thought. Construction of the largest telescope (ELT – Extremely Large Telescope) by the Europeans has begun in Chile. ELT will be 39 meters (about 1550 inches) in diameter. It will have a segmented mirror and be at 3000 meter elevation. Operation is to begin in 2024 and will cost $1.2 billion. Meanwhile, progress has been made on the resumption of construction on the US’s largest telescope (TMT – Thirty Meter Telescope)(30 meters is about 1200 inches) on the summit of Mauna Kea in Hawaii. Mauna Kea is possibly the premier site in the world for a large telescope. Light pollution is at a minimum and its 4000 meter elevation puts it above most of the atmosphere permitting prime infra-red observations. But protests by the aboriginal Hawaiians, (TMRO Orbit 10.37 3 min to 6.6 min mark has good summary), who feel the mountain top is sacred ground has halted construction for a few years. Telescope construction started in 2011 and was to be completed in 2018 at a cost of $1.5 billion. Part of the compromise to resume construction is the shutdown of several other smaller telescopes to reduce the footprint taken by facilities on the mountain. 76% of Hawaiians favor its construction. An alternate site has been proposed in the Canary Islands but research would suffer because it lacks the elevation of the Hawaiian site. merging into a single black hole with 52 times the mass of the Sun. In the final half second of the inward spiral 3 times the mass of the Sun was converted into gravitational waves. No light was produced. During the time of the merger the event produced 50 times more energy than the rest of the entire universe combined. For energy comparison the Sun will only convert 1% of its mass to energy during its 8 billion year lifetime. The second detection tentative event was 23 and 12 times the mass of the Sun. 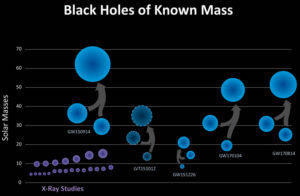 The third was of 14 and 8 times the mass of the Sun black holes. 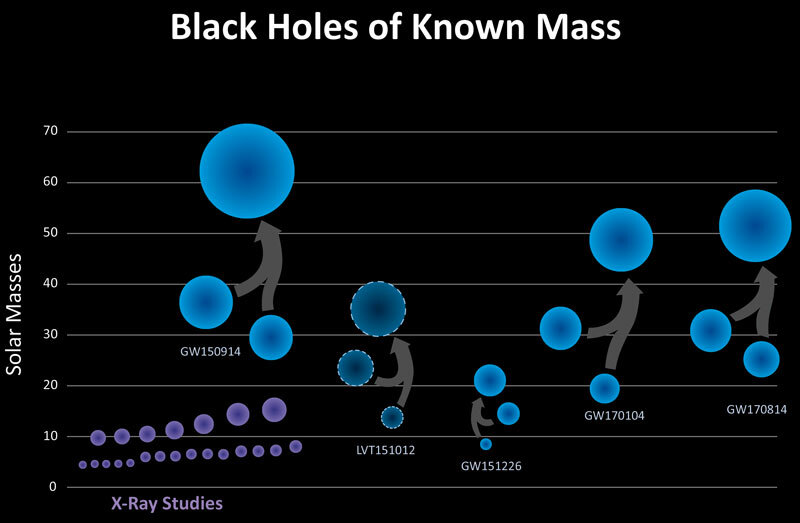 The fourth detection was 31 and 9 times the mass of the Sun black holes. The fifth was 31 and 25 times the mass of the Sun black holes. All these detections are events 1 to 3 billion light years away. Scientists can determine from the frequency and duration of the waves whether the black holes are spinning in the direction of their orbits as they merge. The allignment of the spin will say much about whether the black holes were binary stars (spin highly alligned with orbit), stars within a cluster (spin somewhat alligned) or just random encounters (spin random). Scientists did not see any delay in the merger in the currently detected events, so the spins do not appear to be alligned. As scientists build up statistics from numerous events, it should help determine how these large stellar black holes formed. Theories predict that the very first population of stars (Population III) with no metallicity (non-hydrogen elements) were enormous, maybe up to 500 times the mass of the Sun. It is still a mystery how the super-massive black holes (the Milky Way’s is 4 million times mass of Sun and others are billions of times the mass of the Sun) at the center of galaxies apparently formed just a few hundred million years after the Big Bang. And why no intermediate sized black holes have been found. Three scientists have won the most recent Nobel Prize for their work. But the biggest news was the recent detection of gravitational waves (see the 15 minute PBS video on the possible detection) from the merger of two neutron stars about 130 million light year away. These neutron stars are much lighter (1.5 and 1.1 times the mass of the Sun) and therefore create a much weaker but longer lasting event (100 seconds long). Scientists have called the event a kilonova (see the short video on what a kilonova looks like). About 1-2% of the matterial of the stars was ejected while the remainer became a black hole of just less than 3 times the mass of the Sun. The neutron stars were orbiting so quickly that they made 1500 orbits during the 100 second event. Neutrons stars are made of highly compressed matter (compressed to the density of the atomic nucleus) and are only 10 miles in diameter even though they contain more mass than the Sun. They come from the supernova explosions of stars 4-8 times the mass of the Sun. Scientists believe that this kilonova event churned out 10,000 earth masses of gold (that number comes from a Washington Post article, subsequent estimates are more like 10) and tens of earth masses of uranium. The kilonova acts like an enormous particle accelerator when its neutrons impact the ejected matterial building up heavier and heavier elements. 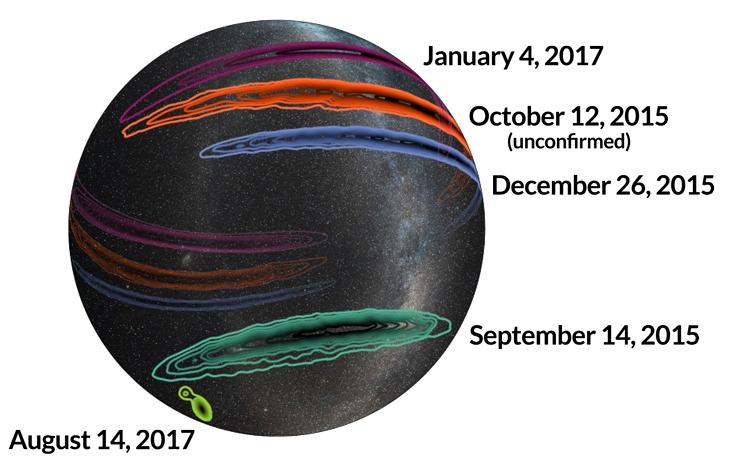 Most of energy of the event was shot out of the poles of the merging neutron stars. 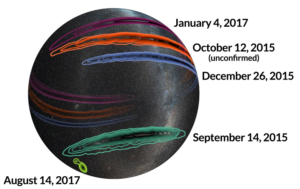 The event was detected on August 17, 2017 and a third gravitational wave detector (VIRGO) in Pisa, Italy helped the two US detectors in Hanford, Washington and Livingston, Louisiana pinpoint the location of the event down to only 100 galaxies. Within 12 hours, scientists had found a visible light source in the ninth galaxy searched, NGC 4993. The Fermi satellite also detected the gamma rays coming from the event and labeled it also as a short Gamma Ray Burst (GRB). This now helps to confirm that GRBs are neutron star mergers. Correlating visible light with the gravitational wave information will allow theorists to help see what is happening in the core of these neutron stars. A place that we could never see light coming from. Very exciting!!! New Horizons Next Target – The next target is 2014 MU69, a 230 mile wide (it might be two bodies 11 and 12 miles wide) Kuiper Belt Object (KBO) that will be buzzed from a distance of only 2175 miles on Jan 1, 2019. Plutopalooza was a fun meeting to celebrate the flyby of Pluto. Maybe we can re-create a similar event with a 2014 MU69-palooza party. We might have to come up with a catchier name? Let me know if you have any ideas. Getting back to one of my favority planets, Pluto. Who would have thought that we would find Pluto to be an active planet with cryo-volcanoes, a fresh surface without craters, and a heart of nitrogen ice!! People are even conjecturing that Pluto could have life. It has: 1) a liquid water ocean below its surface; 2) latent heat given off by the freezing of ice as an energy souce and 3) theolins (complex carbon compounds that give the planet its pink hue). Somehow the theolins get transported to its moon, Charon, and discolor its -400 degree F surface. Estimated size of solar eclipse audience – An estimated 215 million American adults (88% of adult US population) watched in some fashion. 154 million American adults observed directly using glasses, pinhole viewers or other gear. Within that group 20 million traveled to get a better view. Another 61 million watched indirectly on TV or computers/phones. In rating the eclipse, people gave it a 7.6 for enjoyment and a 7.0 for educational purpose. The estimates were based on survey of 2000 people. For the MASS group, 7 of us traveled to see totality and several tried to catch the partial eclipse in Chicago. Not bad for a group to 12 or so. 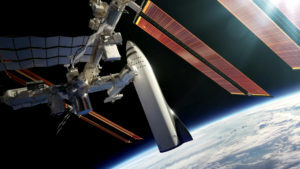 Commercial Crew dates slip 2-3 months – SpaceX slips to April 2018 for its unmanned Dragon to the ISS and to Aug 2018 for its manned mission and Boeing slips to Aug 2018 for unmanned Starliner capsule to the ISS and to Nov 2018 for the manned docking. Even with slippage we are still less than a year to SpaceX’s goal date, a MASSPrize winning event of a $20 Dairy Queen gift card. Our most optimistic members, Jim A., Carol and Kevin have already seen their date guesses come and go but there is still hope for the remaining 9 of us. The linked web site has nice pictures of the Dragon and Starliner capsules and a short video talking about commercial space.